We returned to Lajes do Pico during the last days of April 2017 to pursue our photo-identification studies of blues whales in collaboration with Espaço Talassa, and several other whale-watching companies operating in the Faial-Pico region. The grey dampness of the island enveloped us as always, with clouds descending to the ridge just above Lajes, the island’s capital. The volcanic peak for which Pico gets its name, made several appearances through and above the clouds, though generally only for brief glimpses. The early morning often provides the best views, coloured in reddish morning light, before the wispy mist turns into denser clouds throughout during the day. It is when we are offshore looking for blue whales, that Pico is often best viewed, less encumbered by shore-hugging clouds. The peak for which Pico gets its name is best observed from the sea. We were joined by a Dutch group last year, who took part in a week-long stay to see and learn about blue whales and other species travelling through the area. The group was animated and enthusiastic, and rewarded by sightings of several ‘blues’, as we often refer to them. They were also treated to sights of fin, humpback, and sperm whales, as well as Risso’s, common, and striped dolphins. 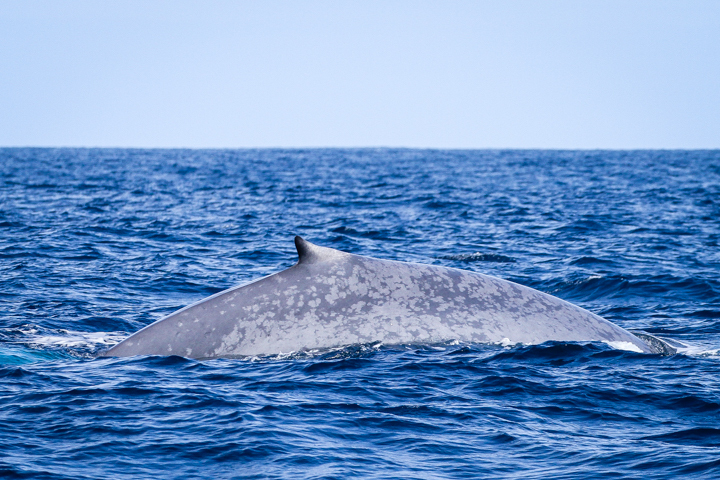 Blue whales are present in the Azores from March through to June, and rarely into early July, as was the case in 2017. Some blues appear to pass through for a few days before moving on into the expanse of the North Atlantic Ocean. Some perhaps heading as far North as Iceland, Spitsbergen (Norway), East Greenland, or other destinations that we are yet unaware of. As the clouds hug the shoreline, we set off in search of blue whales offshore. What has been become clearer, through our photo-ID data and acoustic findings by Dr. Chris Clark and associates is that they do use much more of the North Atlantic basin than we once thought. Not just migrating headlong to the far North, but finding prey over all manner of sea mounts, banks, shelf edges and canyons, most often far from where we can reach them on a regular basis. By continuing to compare catalogs of blue whales from different geographical areas, we have found additional matches between the Azores and Spitsbergen, but not as many matches to other known northern destinations as we would have thought. In 2017, we were able to collect 80 blue whale IDs around Pico and Faial Islands, with an additional contribution of 17 more from the island of Terceira by Guilherme Estrela. This total of 97 individuals was the third highest number of blue whales identified in the Azores in a single season to date. Most were new to the catalog, including five more cow-calf pairs and one more possible blue/fin whale hybrid. The latter would need to be verified through genetic analysis, however, we were not equipped to do so in the Azores. Indeed, biopsy sampling is a research method that requires special permits that are delivered by local authorities for specific research purposes. MICS holds research permits for use in Canada, and would have to partner with local research institutions in the Azores to biopsy a blue whale there. Whilst we are still processing new images, our analysis to date indicates that we should have around 700 blue whales catalogued for the northeast Atlantic (NEA) when the work is completed. This is a much larger number than we had ever imagined, and leads us to think that the NEA blue whale population is in good shape with an adequate recruitment (birth) rate. As much as we would love to, we cannot be everywhere. The North Atlantic is vast, and blue whales cover huge distances. Collaboration is one of our greatest strengths, and the key to understanding blue whale dispersal, abundance, distribution, and habitat use in the North Atlantic. Thanks to our Azorean contributors, including Lisa Steiner and Monicete from Sao Miguel, we will benefit from a more detailed view of preferred routes blue whales take through the archipelago in the spring. We have now been able to determine their movement between the islands of Sao Miguel, Pico, Faial, as well as Terceira. In 2017 we had an 7.2% return rate of known individual blues in the Azores. Additionally, two IDs were collected from northern Spain in the Bay of Biscay, one of which was a second match between there and the Azores. This was a ‘within-year’ match first sighted off Pico in early July 2017, then off northern Spain in mid-September 2017. We also had our first ID from the coastal waters of mainland Portugal in late October. In addition, there were 18 blues photo-identified off of Spitsbergen, of which 3 matched to the Azores, 6 from off Mauritania, and 4 from Iceland. Most excitingly, we discovered a second cross-Atlantic match of a blue whale first observed in the St. Lawrence Estuary in September 2010, that was photographed in the Azores on May 24th, 2015, then again in the Mingan region in August 2017. EB464 is only the second blue whale ever to be known to cross the Atlantic Ocean. So far, this is still a small sample size to draw any conclusions, but we may still find such instances as we collect more data. It is with great anticipation that we will once again return to Lajes do Pico this spring for two weeks (end of April-early May) to continue our efforts there with our valued collaborators. And as the catalog grows, we should be able to better understand how the pieces of the blue whale puzzle for the North Atlantic fit together. Check back in May for more information!